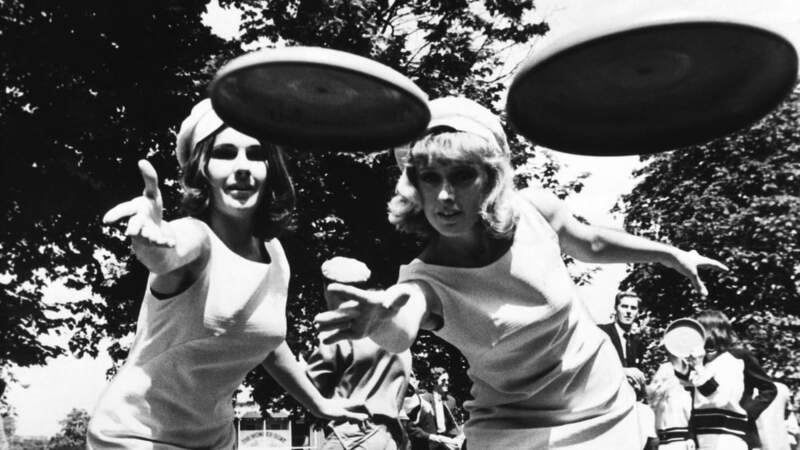 RETRO KIMMER'S BLOG: THE INVENTION OF THE FRISBEE! THE INVENTION OF THE FRISBEE! 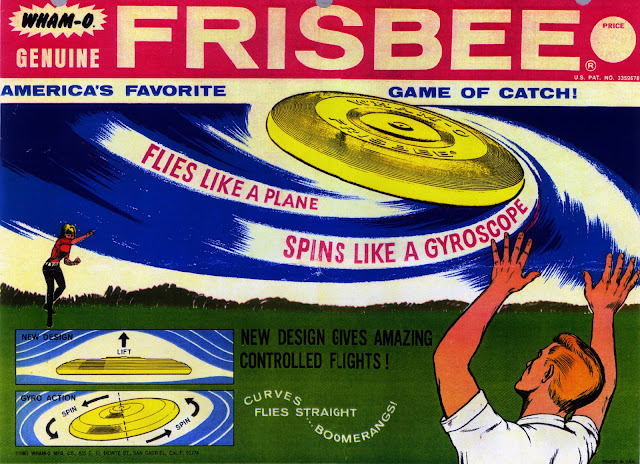 On this day in 1957, machines at the Wham-O toy company roll out the first batch of their aerodynamic plastic discs–now known to millions of fans all over the world as Frisbees. The story of the Frisbee began in Bridgeport, Connecticut, where William Frisbie opened the Frisbie Pie Company in 1871. Students from nearby universities would throw the empty pie tins to each other, yelling “Frisbie!” as they let go. In 1948, Walter Frederick Morrison and his partner Warren Franscioni invented a plastic version of the disc called the “Flying Saucer” that could fly further and more accurately than the tin pie plates. After splitting with Franscioni, Morrison made an improved model in 1955 and sold it to the new toy company Wham-O as the “Pluto Platter”–an attempt to cash in on the public craze over space and Unidentified Flying Objects (UFOs). In 1958, a year after the toy’s first release, Wham-O–the company behind such top-sellers as the Hula-Hoop, the Super Ball and the Water Wiggle–changed its name to the Frisbee disc, misspelling the name of the historic pie company. 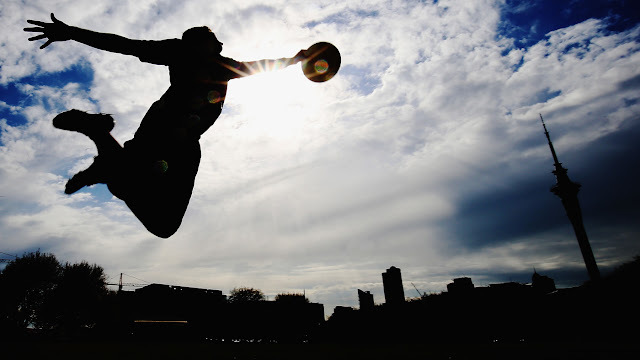 A company designer, Ed Headrick, patented the design for the modern Frisbee in December 1967, adding a band of raised ridges on the disc’s surface–called the Rings–to stabilize flight. By aggressively marketing Frisbee-playing as a new sport, Wham-O sold over 100 million units of its famous toy by 1977. MICHAEL GANDOLFINI CAST IN NEW SOPRANOS FILM! EDDIE IZZARD BRINGS WUNDERBAR TOUR TO USA!! GAME OF THRONES SEASON 8 TO PREMIERE APRIL 14! RICKIE LEE JONES RELEASING NEW VINYL LPS! ARE NATURAL HUMAN GROWTH HORMONES WORTH TAKING?